It’s a full moon today. So, here are a few tips to take great photos of the moon. Grab your camera and go out there. The moon has always been a scene that attracts many amateurs and professional photographers. It’s without question the brightest spot in the night sky and maybe due to the lunar mystic or simply due to its beauty a magnet for cameras. But photographing the moon is not as linear as it seems. The moon is very bright (more than you probably think) and getting the right exposure that avoids the flat look can be tricky. Tripod – Although it’s a quick exposure, you’ll get the best results setting your camera on a tripod. Remember that you want detail and any kind of motion blurring can ruin the shot. 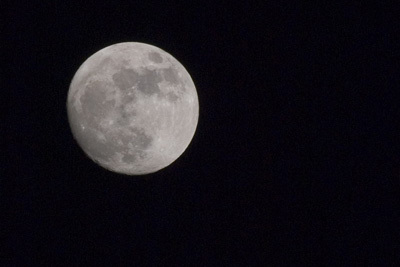 Telephoto lens – Ah, how nice and big the moon looks… So why does it come out so small in a photo? It’s like that… For a good moon shot you’ll need a telephoto lens. You don’t need an expensive one (I used the cheap but so far good Sigma 75-300 f4-5.6) but for good detail a minimum of 300mm is recommended. Shutter Release cable – Not really needed but recommended. The pressure of your fingers on the shutter button will increase the motion blur. To avoid this you can get a shutter release cable or do like I did (I didn’t had my cable with me) and use the shutter delay feature of your camera (I’m sure it has one). A 2 sec delay is more than enough to get your hands of the camera. One of the most common mistakes photographers make when first attempting to get lunar shots is underestimating the brightness of the moon. The first shots will almost undoubtedly come out overexposed with an ugly bright circle where the moon should have been. Many photographers claim that since the moon is directly illuminated by the sun, setting your camera for a “daylight photo” can be a solution. Some also recommend following the sunny 16 rule (f/16 at 1/ISO) or the loony 11 rule (f/11 at 1/ISO). If you take a look at the photo above and the settings I used, none of these actually applied but probably due to the fact that the Earth’s atmosphere absorbs a huge amount of the light and this value varies according to the angle of the moon above the horizon. Using a “fixed” value does not work and you should experiment to find the best results. I tried the following the loony 11 but gave an overexposed moon with some detail loss in the brightest areas. Now set your autofocus to point, aim at the moon, focus and turn the autofocus off. Don’t touch that ring anymore. For good measure bracket your EV 1 or 2 units (if your camera allows you can get a few sequential shots with different EV values). And that is it. Moon photos galore. Now that you have your moon, it’s time to work on it in silico. The photo above was only cropped. No other processing. So, you can see that is possible to get average moon photos just out of your camera. If you want to make it even better, try playing a bit with the curves on Photoshop. You’ll probably manage to give more texture to your photo by increasing the contrast between midtones and highlights. Somehow I liked the result as it is (albeit flat) and decided not to touch it anymore. If you want a more natural texture with more shadows, giving the lunar landscape a more tri-dimensional feeling, try shooting the different moon phases and not only full moon. The different angles at which the sun illuminates the lunar surface can create astonishing effects. Now, this photo was taken back in the end of April, but for what I can see, today is full moon or very close to it. So, why not go outside and be creative? Let’s hope there are no clouds wherever you are. I used my Canon 600D with a 55-250mm lens, and your settings (aperture f/11, ISO 100 at 1/125). I had no idea what I was doing and am really happy with the result! Tried photographing the moon before looking for tips, using a Sony Nex7 with an old (20 years+) Canon fd300mm f2.8L. Absolutely concur with your advice. I set everything to manual, and guessed settings for first attempts and everything was massively overexposed! With the lens wide open I had to go to shutter speds of over 1/500 th second! This did the trick. Simple and effective advice. Thanks!